David Bowie died of cancer on January 10 – see The Guardian for mainstream news coverage. In addition to all the science fictional imagery and references in his music, he cut a great figure onscreen in genre productions like The Man Who Fell To Earth, The Hunger, and Labyrinth. Rob Bricken discusses “All the Ways That David Bowie Changed Our Lives and Expanded Our Minds” at io9. When David Bowie passed away this morning, we didn’t just lose him. We lost Ziggy Stardust and the Thin White Duke. 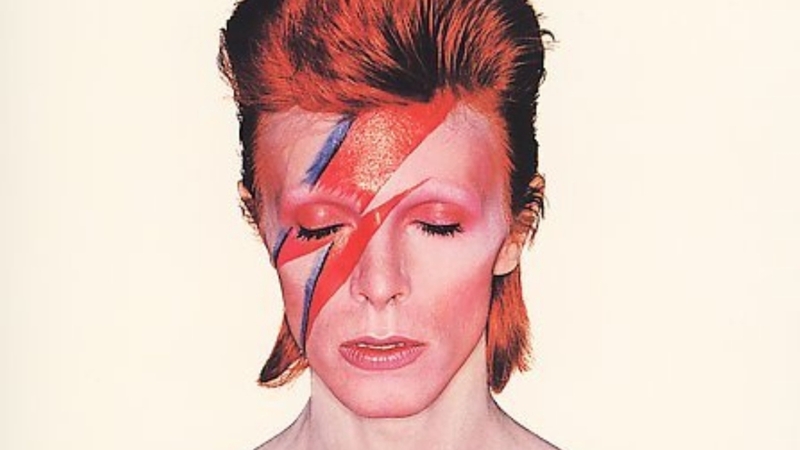 We lost Aladdin Sane, and Thomas Jerome Newton, and the Goblin King. We lost an explorer, a pioneer, one of the most creative, brilliant musicians of the 20th century. And we lost the greatest rock star the world has ever known. Adam Whitehead wishes “RIP David Bowie” on The Wertzone. Bowie’s undeniable contribution to the world of music has been covered, extensively, on thousands of blogs and news sites today. However, he also played a significant role in the pop imagery of science fiction and fantasy. His first hit single, “Space Oddity” (1969), was about a fictional astronaut blasting off into space. The song was partially inspired by the movie 2001: A Space Odyssey (released the previous year) and was used to help soundtrack the BBC’s coverage of the Apollo 11 moon landing. Bowie returned to the imagery of space for “Life on Mars” (1971), a track on his seminal, career-redefining record Hunky Dory. It was re-released by Bowie (in his Ziggy Stardust persona) in 1973 to huge acclaim and later soundtracked the well-regarded BBC time travelling drama Life on Mars (2006-07). A later Bowie track, “Ashes to Ashes” (1980), provided the title for and was also featured on the sequel series, Ashes to Ashes (2008-10). In February 1972 Bowie reinvented himself as the glam-rock superstar Ziggy Stardust, supposedly a being from Mars who visits Earth to help stave off its impending destruction. SF Crowsnest ran a straight obituary with many interesting facts. In the BBC’s 2002 poll of the 100 Greatest Britons, Bowie was placed at number 29. Throughout his career, he has sold an estimated 140 million records worldwide. He was inducted into the Rock and Roll Hall of Fame in 1996. I wouldn’t think that David Bowie’s death would hit me so hard. It’s just so damned unexpected. Elizabeth Bear said once that David Bowie would still be cool at the heat death of the universe. I think I vaguely expected him to still be *there*, at the heat death of the universe. John Scalzi penned this line. Part of me genuinely believed he was an alien who would live forever. Part of me still does. Gaiman uses the Thin White Duke persona as a starting point, writing his way into the type of person who could embrace such an alter ego. And though the author refers to the story as “unabashedly fan fiction,” after a few paragraphs he makes the character his own, and creates yet another pocket universe for the Duke to test his bravery, create stars, and forge a new life for himself. It both is and isn’t Bowie, as Gaiman uses the idea of self-creation as the core of a story that could be about any one of us. Neil Gaiman‘s “The Return of the Thin White Duke” is a free read at his website. He was the monarch of all he surveyed, even when he stood out on the palace balcony at night listening to reports and he glanced up into the sky at the bitter twinkling clusters and whorls of stars. He ruled the worlds. He had tried for so long to rule wisely, and well, and to be a good monarch, but it is hard to rule, and wisdom can be painful. And it is impossible, he had found, if you rule, to do only good, for you cannot build anything without tearing something down, and even he could not care about every life, every dream, every population of every world…. Kameron Hurley boldly answered Bowie’s passing with reflections on her own mortality in “Yes, We’re All Going To Die”. But I’ve found a great freedom in knowing that I could die at any moment. I have head-butted death in the face, and though it may be stunned for a while, there’s no knowing when it will recover and come snarling back for me…. I understand now, maybe, what David Bowie realized when he found out he had cancer, and suddenly time was limited, and there was a mad flurry of last-minute work to do before the end. I first saw David Bowie in Labyrinth when I was 11 years old, and to be frank, seeing a Goblin King dressed like that who still liked women was a revelation to me at 11, and it had a powerful impact on my work and my conception of sexuality from there on out. He was my introduction to genderbending, and the more work of his I listened to and watched, the more it expanded my idea of what people could be. That’s a powerful legacy. I find myself thinking about The Man Who Fell to Earth – another film I didn’t appreciate or understand until after I got sick – pretty often. It’s a story about how life grinds you down. How even those with the best intentions and the most powerful motivations can find themselves smashed down by bureaucracy, by time, by despair. I never want to be smashed down…. This entry was posted in In Passing and tagged Adam Whitehead, C. E. Murphy, David Bowie, John Scalzi, Kameron Hurley, Neil Gaiman by Mike Glyer. Bookmark the permalink. My first introduction to David Bowie was a little unusual. It was through a strange little video game called Omikron: The Nomad Soul. I don’t think I could describe the plot in any way that makes sense, but it had Bowie as both some sort of rebel against some meta-Authority, as well as providing some of the music and lyrics for the game. Subsequent experiences of him were a little more normal – Labyrinth, Prestige, Life on Mars, and ever so slowly onto the background music of my life. He was an incredibly talented man who managed to keep being incredibly weird.Plus, when your kid has to go from Zowie Bowie to Duncan Jones, I figure you’re being awesome on a level we cannot comprehend. We need to call up our local radio stations and ask for a play of “Space Oddity”, dedicated to the good ship Arbitrary and all who sail in her. One of the more surprising tributes I saw was this image, posted by … Studio Ghibli! Oh, Studio Ghibli, you are amazing. Such a strange day it has been. He followed his passions where they led him. He got stuff done. As a friend of mine liked to say, he added to the available stock of reality. I’m grateful I got to see him in concert three times. The one with Nine Inch Nails was particularly magical. But during the third concert, on what I think was his last-ever tour, he had what he called “a performance malfunction” and confessed to not feeling well. I’ve felt his departure coming for a while, and been really happy to get two more albums from him. But I’m still going to be bummed about this all week. Scott Lynch has a relevant tweet on this matter…. I hadn’t seen the version of Space Oddity Chris Hadfield recorded on the ISS before this morning. Which probably just makes me last. I was surprised to discover that David Bowie has been enshrined in the Science Fiction Hall of Fame, located on the basement level of the EMP museum in Seattle. I’d certainly have wanted to eavesdrop the selection committee on how that came about. Rich Lynch: If you recall that the original scheme for the EMP museum building in Seattle was to divide it between science fiction on one side and pop music on the other that makes the explanation easier to guess. That makes three Little Prince tributes I’ve seen so far. I’m sure there are others. But I would never have guessed that Little Prince/David Bowie mashups were a thing. I don’t know *why* I wouldn’t have guessed. It makes so much sense. David Bowie and Tilda Swinton as Tilda Swinton and David Bowie. If you recall that the original scheme for the EMP museum building in Seattle was to divide it between science fiction on one side and pop music on the other that makes the explanation easier to guess. But Bowie was not inducted until 2013. I don’t see a problem, though – as an actor, he clearly belongs to SFF, and he was also surely the most science-fictional of popular musicians. Shouldn’t we note that David Bowie was Duncan Jones’s father? I bought BLACKSTAR (Bowie’s new album) on vinyl yesterday. I really hadn’t expected to burst into tears. Bowie had a bit part in TWIN PEAKS: FIRE WALK WITH ME. I have never figured out if that’s genre, so I count it. In 1977 (? ), Bowie appeared on the Bing Crosby Christmas special, and performed ‘Little Drummer Boy/Peace on Earth’ (Bowie composed the latter as a descant). Bing’s hair was green, and shaped like Tintin’s. Bowie looked ‘normal.’ I really wondered then why adults thought Bing was respectable, and Bowie the weirdo. THE RISE AND FALL OF ZIGGY STARDUST AND THE SPIDERS FROM MARS is one of the finest music recordings ever made. That Little Drummer Boy duet between Bowie and Crosby was transcendent. I’ve always liked Christopher Lees version of Little Drummer Boy.